On a recent walk through the Farmer’s Market I saw a beautiful scented Jasmine – not too strong, not too sweet, just right. Creamy white Jasmine flowers look very dramatic against their glossy dark leaves, but it is no drama queen. Jasmine is considered the King of Flowers. The Jasmine flower releases its intoxicating fragrance after the sun has set. To produce an oil, the flowers are hand-harvested at night or early morning. After a labor intensive process, a Jasmine absolute is created that has a warm but slightly spicy scent. This commanding fragrance is known to scent lovers as The King. Jasmine is more than a royal scent – it relieves pain (easing spasms and cramps) and relaxes the nervous system (helping headaches, insomnia and depression). The oil also reduces the emotional effects of PMS and menopause, encourages feelings of optimism and inspiration, and has been deemed an aphrodisiac. 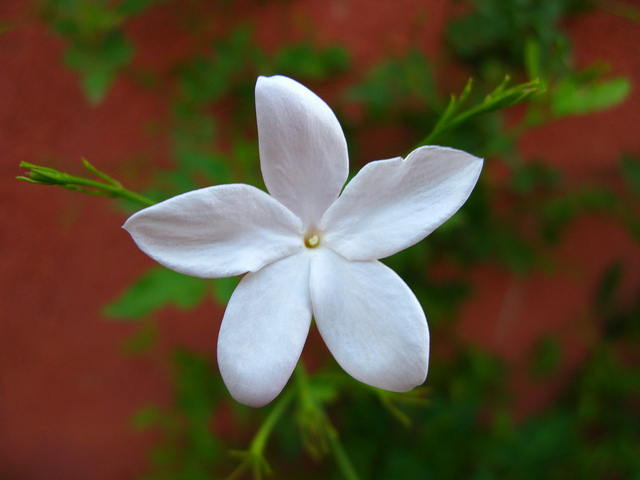 Research has looked into the affects that Jasmine (Jasminum officinale) has on brain activity. One study showed that it stimulated the brain waves of test subjects. In another study it helped computer operators make one-third fewer mistakes. Could wearing a perfume of Jasmine diluted in jojoba oil make us smarter? Although Jasmine is The King, I know of one Queen Jasmine. My cat, named Jasminum sambac after the Indian variety of the flower, rules my house with a regal presence. She may not make me smarter but she definitely relaxes me.